This urinal measures about 225 mm in height and 130 mm in diameter. Although a clear urinal was optimal, this urinal has a greenish tint because of the way in which the glass was manufactured. 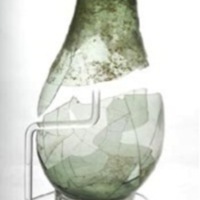 There were several types of glass available in the late Middle Ages for the manufacturing of urinals, although this urinal is most likely made out of “forest glass,” easily identified by its greenish tint. Forest glass was mainly manufactured in Northwest and Central Europe and consists of sand and wood ash. 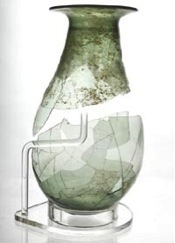 The raw materials being used were often high in iron and manganese, which subsequently gave the glass its distinctive bluish-green tint. “Urinal,” Medieval London, accessed April 22, 2019, http://medievallondon.ace.fordham.edu/items/show/41.